Today I want to share how we organize our curriculum for our 1st grader. This year we are doing Abeka and I couldn’t be more pleased with it. My son is learning so much! He’s becoming and excellent reader and writing with great penmanship. I have found a great way to organize all of his daily work. I had this cart in my closet, not being used and it just happened to work out perfectly. There are just enough drawers for each subject. At the top of the cart you can see my teacher manuals. I keep them there for easy access. This is where I also keep my binder. As I grade his work, I hole punch each page and put them in my binder. This is also where I keep other records like field trips, attendance, and so on. The top drawer says Bible, but also included in this drawer are small supplies like dry-erase markers, the hole puncher, stickers, etc. I have labeled each drawer in the order that we do each subject. This really helps us both know what to do next. The only thing that varies is the seat work drawer. Sometimes he does that out of order because I usually assign seat work whenever I can go take a shower (which varies each day), so he can be working on his work independently. I try to make it a point to take about 15 minutes or so each night to prepare for the next day. This means writing things on our dry-erase board, tearing out pages and adding only those pages to his drawers, and gathering together any other objects that are needed. This is a huge help for me when we do school the next day. When preparing for the next day, I go to my front hall closet where I keep a bookshelf. This is where I store all of the books and cards that are not currently in use. 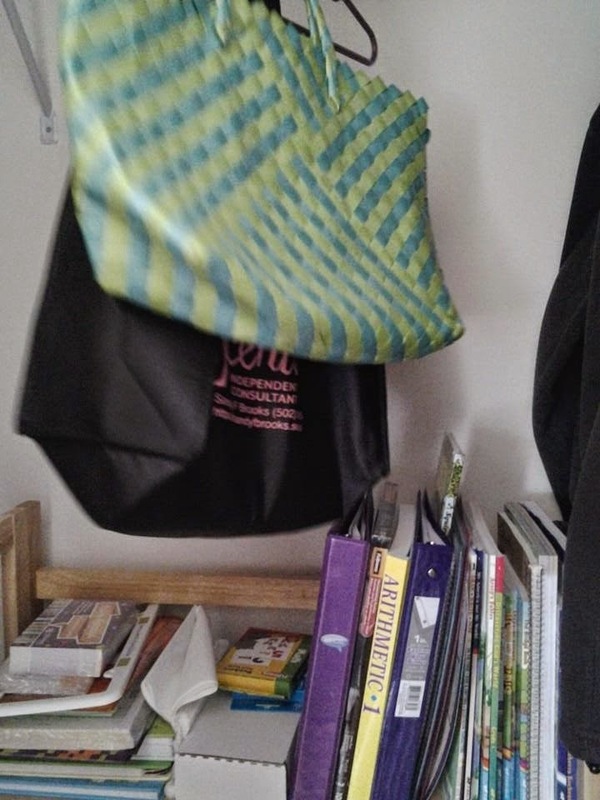 I have bags hanging above the shelf. Inside the bags are things that I have already cut out or prepared, but I’m not currently using. but this is our shelf and it works for us! I hope this has helped you get some ideas to make organizing your homeschool curriculum easier. Without this system I would be going crazy every single day, trying to figure out what comes next. I imagine that I would also be misplacing things and I sure don’t need to add anymore chaos to our days. If you would like to purchase an organizing cart like mine, check out my Amazon affiliate link below! For a limited time, Amazon is doing FREE SHIPPING and you don’t have to be a Prime member! Don’t miss out! If you have organizing tips, please share them in the comments!